The villa, with own private descent to the sea, is built in an elegant and luxurious neoclassical style on four levels and is adorned by tens of archaeological objects of inestimable value. 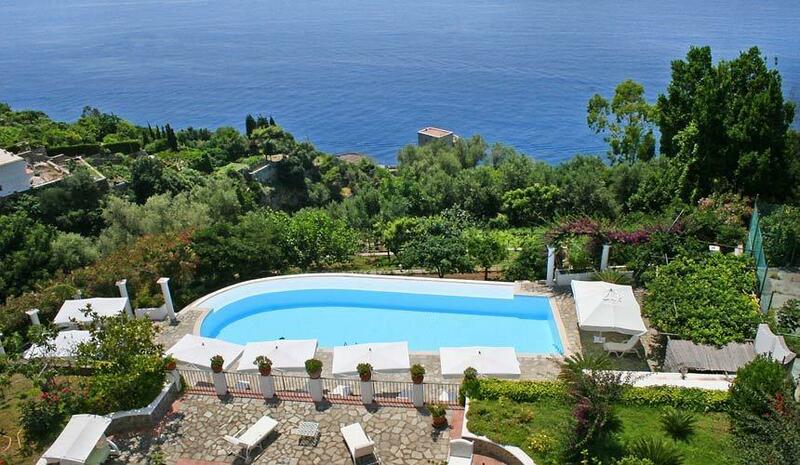 The property enjoys 270-degree sea views, while the entire Western, Eastern, and Southern sides are surrounded by a large, private garden (considered Italy's most impressive, private garden - see description below) with more than 700 species of plants, flowers, and trees up to 60 feet high. A walk through the property - its garden, open spaces, and internal rooms is a truly emotional experience: elegance and classicism, all with a very strong relationship to local southern Italian traditions, can be found through the property's décor, paintings, and various artefacts. Marble columns and fragments complete its style, while it is difficult to verbalize what the villa truly represents. Guests will surely be overwhelmed by its history, as well as its gardens, style, detail, and stunning sea views. At the end of your first trek & journey you will surely be filled with the desire to begin your tour all over again. Located in the centre of Sorrento, among the Lands of the Syrens, this property stand on the top of a promontory with a sheer drop off, into the sea. The property faces out towards Naples and Mount Vesuvious. 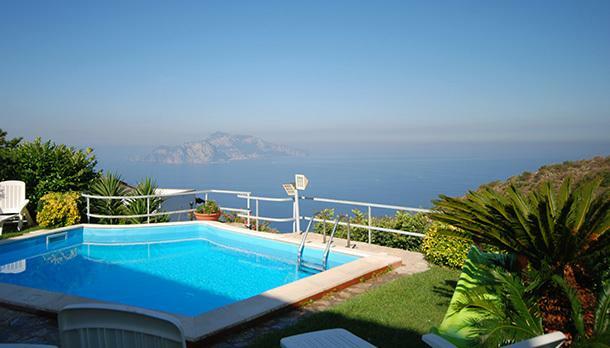 Centrally located, the villa is just a few hundred meters from the historical centre of Sorrento, where tiny shopping streets and the main, cosy family-run trattorie and restaurants are located. The port of Marina Grande, from where Jet and hydrofoil connections to Capri and to Naples lie, is situated close to the villa in an area reachable either by foot or by an elevator. There are also several nice public and private beach establishments within walking distance. 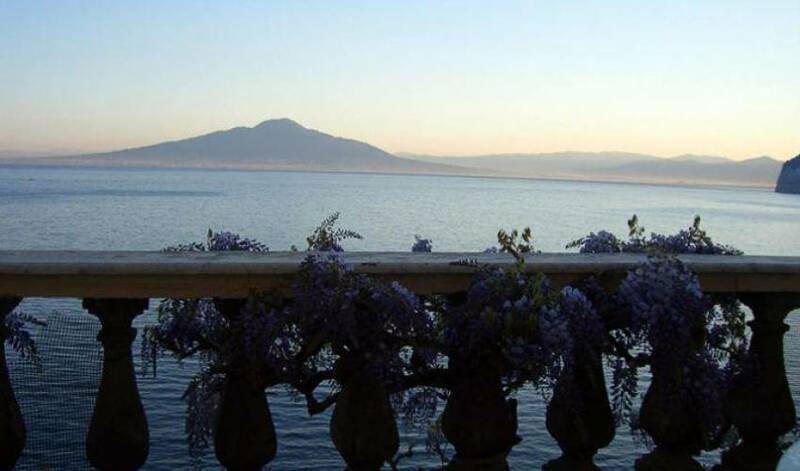 Thanks to its marvellous position smack on the Mediterranean's seafront, this unique villa enjoys stunning sea views out over the entire Gulf of Naples, with Mount Vesuvious, the Island of Procida, and the Sorrento Coast right in front of you. 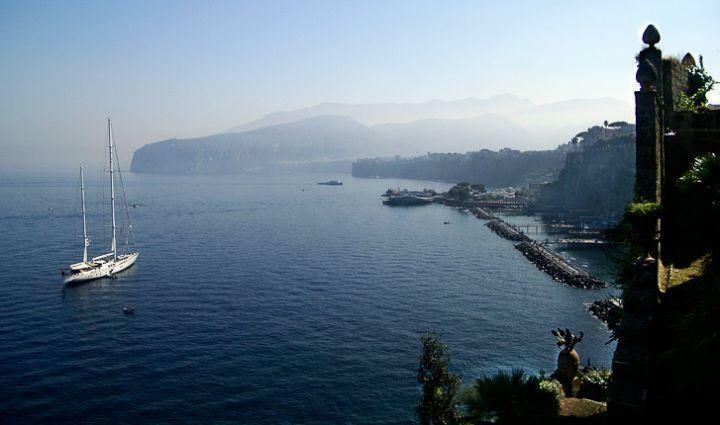 Historical Outline Long before Wagner, Ibsen, or Byron discovered its delights, the peninsula of Sorrento attracted powerful and perceptive visitors. During the first century A.D. Agrippa Postumus, grandson of Emperor Augustus built a fine villa on the peninsula right beside the present town on the site of what is now Villa Poseidon. That villa was built entirely with precious marble from the farthest provinces of the Empire and with many Egyptian and Greek works of art. It was here that Ovid accompanied Giulia, Augustus's granddaughter, for what was to prove a most disquieting encounter. The first floor of the original property was completely buried in the eruption of Mt. Vesuvious in 79 A.D. Forwarding to the 13th Century, the site was turned into a convent by a group of cloistered nuns, however, after a destructive invasion by the Saracens in the 16th C., Dominican priests rebuilt the property. These priests were the first who began to cultivate its gardens, importing the property's first citrus fruit trees from the Middle East. In 1888 the villa became private when it was sold to the a Count, a distinguished collector of antiquities and friend of Schliemann, the excavator of Troy, who bought the site and began to build its present house, which he called "Aux Roches Grises", recalling the grey rocks on which the house currently stands. 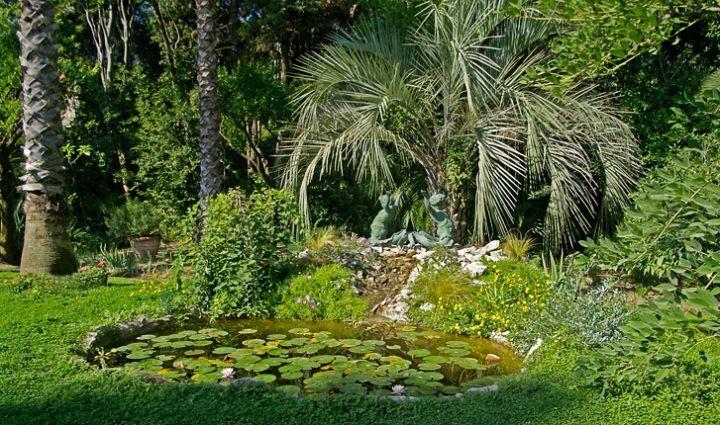 He also created what is now one of the finest, private gardens in all of Italy. At the beginning of the twentieth century, William Waldorf Astor (the first Viscount Astor) came to Italy as an Ambassador, immediately fell in love with Sorrento, defining it as "the most beautiful place on earth". 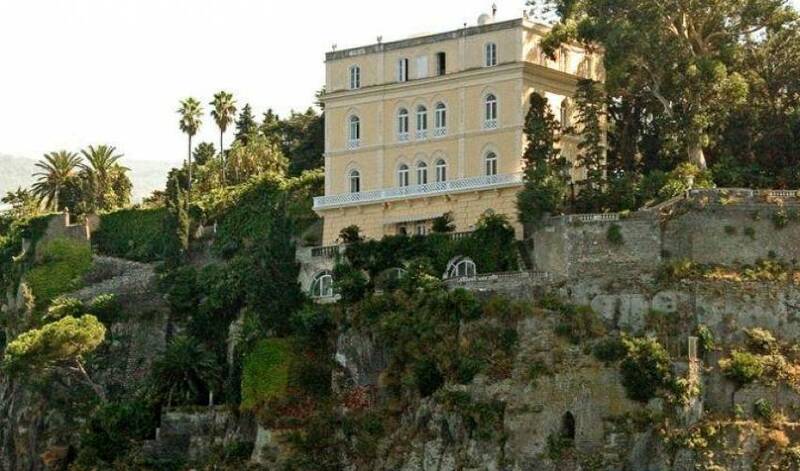 He bought the villa in 1906, enlarged its gardens and made a repository for his vast and ever-growing collection of classical, medieval, and Renaissance statuary. The convent was destroyed and a wall along the property's seaward side was raised, where various openings were made and decorated with medieval ruins and Greek-style temples. The garden was enriched by a precious collection of exotic plants, which soon acclimated to the mild Mediterranean air: Beaurcarneaue from Mexico; Cycas from Polynesia and Australia; Erythrineae from Brasil; Jacarandeae from Chile; Jubeaue from Egypt. After Lord Astor, the villa changed hands several times until, from 1943 - 1945, the property hosted Benedetto Croce, turning it into a political crossroads for the rising Republic of Italy. In fact, the official signing of the declaration for the first Italian government post WWII was signed in the room which is used as the present study. Today, a welcoming Italian family, who purchased the property in the 1970's and have continued to uphold the historic significance of its history, gardens, and artefacts, owns the villa. At the beginning of the twentieth century, William Waldorf Astor bought the house and, where the convent once stood, designed its gardens, encircled by walls and balustrades, to protect his private and exotic oasis of palms, oranges, cycas, cypresses, eucalyptus, and pine trees. 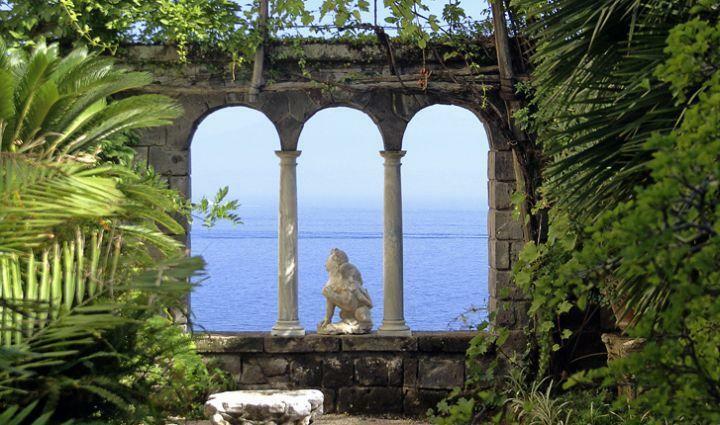 Secret paths and alleyways run through the lush vegetation revealing statues, urns, fountains, and glimpses of sea and sky through the windows cut out in the high wall along the seaward side. The villa's spectacular garden was designed and built following the dictates of three different landscaping schools: The Italian Renaissance School, English Style, and Gothic Revival. The garden faces the Northern, Southern and the Western sides of Sorrento, and each part of it is designed according to its own spirit: The Northern side has symmetric terraces and straight paths and is lined with classical statues, sarcophagi, urns, fountains, capitals, and wineskins, while housing the oldest fragment found in the garden, which dates back to more than 600 B.C. The Southwestern side is inspired towards the Classical English garden concept as one views, upon entrance to the property, majestic palms, Chamerops and Cycas, which welcome its visitors, and Ilexes and Araucariae which stand over sixty feet tall. A sarcophagus, situated to the right of the entrance, stands next to two Medusa heads of rare beauty and several renaissance benches made of Siena yellow marble. Across the entrance a hidden amphitheatre invites the visitors to follow the tile steps leading to the secret garden. Ecstasy takes charge as the deep blue sea and Mount Vesuvious appear though a three-arch stone window, where a stone siren lives. Mullioned windows, situated along the East side, separate the visitor from an open view, due to its antique Japanese technique - shakkei - meaning "borrowed landscape". Beautiful marble busts showing Mercury, Dionius, Juno, and Mars appear as you walk through the garden. Roman and Punic amphora testify how the Mediterranean has always been filled with good exchanges. Other important fragments and elements in the garden include a Paleochristian sarcophagus. On your way through the gardens delights, a small greenhouse suddenly appears from behind the hidden greenery, opening its doors to an ensemble of orchids, bromelie, hoya, and diverse flowers. The Zen wall lines an area with huge Eucapultus trees while, unexpectedly, the small port of Sorrento, Marina Grande, a delightful mini-harbour crowded by colourful houses, boats, fishermen can be seen from above. The garden is lit by garden-candles and lights and it doted by stereo system playing Mozart's witty and joyful music throughout. The garden features a marble topped table with 10 iron chairs, which can be used for enjoying a garden picnic, while nearby lounge chairs line the irregularly shaped swimming pool (2 - 4 meters wide x 8 meters long). A vegetable garden, also part of the property, lies on opposite side of the street from the villa, providing guests with fresh fruit and vegetables varying during the different seasons. The marble columns found in the hall of the villa once belonged to the Imperial Villa of Aprippa Postumus. They are antique-yellow colors and are built from marble deriving from the marble caves in Numida, which today is referred to as the country of Tunisia, where important Roman ruins such as the town of Cartagine reside. The caves of Numida provided the Roman Empire with some of the most prestigious and beautiful marbles known to man. The marble columns of reference were made with the materials which came from the sites' very last excavations. One of the property's centerpieces is the statue of the seated woman from the Byzantine era, dating back to the 5th century B.C (as well as one of the double-faced bust sculptures). It is one of the oldest and most precious archeological remainings on-site. The statue clearly follows the Syrian style of sculpture and is believed to come from Syria. This piece also comes from the Villa Imperiale. Many archeological remainings, fragments, vases, and statues which so beautifully décor the present villa are the originals which were found in the Imperial Villa of Agrippa Postumus. They were used by the Dominicans to embellish the property's former convent, which was built above the ruins of the Roman Villa, and were then used by the Viscount Astor (and now by the present owners) as wonderful décors. Other pieces found throughout, such as Ming & Byzantine vases, originate from different archeological excavations and are, today, part of the owner's private collection. The statues which are found throughout the main halls of the villa are Roman copies of original Greek (Byzantine) statues (such as Acefalea), dating back to the period of the Emporor Agustus. in the niches of the lounge are well made copies, made by the Romans, from Greek statues. These are dating back to the period of the Emperor Augustus. Ground floor The entrance to the neo-classical residence is very soft. A private driveway leads through the garden right down to the entrance door. 8 steps down a paved area of the garden sit several benches, while two Carrara marble sculpted lions, crouched as if guarding the entryway, lead to the main door. The elegant hall, lined entirely in marble and white columns, is adorned with important marble fragments and Roman statues. This hall offers ½ bath with black floor tiles.Access into an elegant lounge facing the sea has 3 French doors, which lead out onto a terrace. The lounge has parquet floors, 4 sofas and 4 comfortable, white armchairs; glass topped table, with capitals from Roman villas; TV and DVD; antique statues and sculptures, wall paintings, and decorative small tables in mother pearl, as well as special lighting, adds to the elegance and intimacy of the property. Access from the lounge is into Study with parquet floors and French doors leading out onto a terrace. The study, with its antique chest of Ming and Byzantine vases, offers a desk and many antique pieces furniture. The terrace offers incredible views out over the Gulf of Naples with the majestic volcano, Mount Vesuvious, lying directly in front of you, on the opposite side of the Sea. Views are truly spectacular on days when the sun plays with the colours of the deep blue sea as the sky lines the top of the volcano. The marble floored terrace, adorned with beautiful potted cactus plants, has a glass-topped table with the capital Roman columns as a base. One table seats 8 people and the other two tables each seat 6-8 people. (In case of an event or important dinner, the terrace can be arranged to accommodate up to 50 people). The terrace also features an electronic canvas to balance the heat and shade. Along the other area of the first floor of the villa lies the kitchen and dining rooms. The spectacular and large kitchen is divided into two areas and with vaulted ceilings, is tiled entirely with black and white tiles. It features a large semi-round cooking station with 6 stovetops and a sink. The kitchen has several facilities, which allow for preparation of everything from snacks and light meals to full meals or gala dinners. It features a double sink, double ovens, large refrigerator with freezer, ice cream and sorbet maker, toaster, microwave oven and meat-slicer. A small marble table with 2 chairs serves as a spot to drink a morning cup of coffee. The kitchen leads to a terrace, which is an extension of the main kitchen, as it offers external cooking and dining facilities including a brick oven (ideal for pizzas, homemade bread, and meats) and a ceramic tile table with 4 iron chairs. The dining area consists of two, separate dining rooms (one formal, one informal). Both are elegant and portray the style found throughout - Waterford crystal chandeliers, antique furniture, and marble columns. The informal dining room leads directly into the kitchen, on one side, and to the external dining terrace, on the other. The first floor, up 23 steps from the main entrance hall, is where the first of 7 main bedrooms are found. 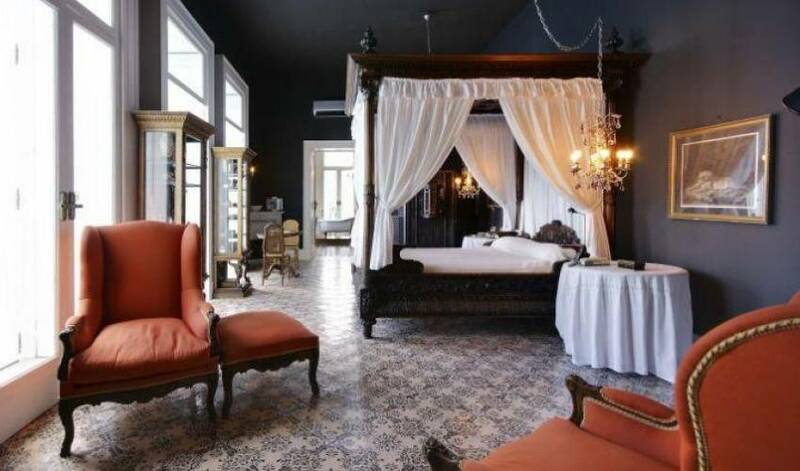 The bedrooms are located on the first, second, and third floors, all up a large, majestic marble staircase decorated with lovely period paintings. Large windows face both the garden and the sea from the floors above. The first bedroom boasts a ceramic tile floor and double bed, large mirror, small fireplace, and 2 French windows facing the garden. Large, marble bathroom with double sink and French windows. The first floor also boasts a second living room with 5 large comfortable armchairs, a glass topped table, and 3 French doors which lead out onto a lovely balcony facing the sea. Up 23 steps from the main entrance hall. The bedrooms are all located along a corridor. One double bedroom has a large antique wooden wardrobe with mirror and desk and window with sea views overlooking tMt. Vesuvious. En-suite bathroom with bathtub. A second bedroom has twin beds, wardrobe and window with both sea and garden viewsMarble bathroom with small tub and tiled with mosaic mirror. Double bedroom with 2 French doors leading onto a terrace and a window looking out onto both the garden and the sea. Fireplace. Small table with 2 chairs and chandelier. Large marble bathroom with double sink. Second double bedroom with parquet floors. 2 windows with garden view. Bath with marble tub. Double bedroom with iron bed, 2 armchairs, 2 bedside tables, 2 windows with sea view. Wardrobe with mirror. Tiled bath with bathtub. Twin bedroom with small wardrobe, with garden view. Bath with Jacuzzi tub/shower and double sink. 23 steps lead up to an unfurnished panoramic roof top terrace. Reachable by an external staircase of 21 steps off the main terrace. This floor enjoys one large relax lounge and serves as a passage way to the direct sea access. This room has large vaulted windows facing the sea, a sofa, foosball, and table tennis. A path of approximately 100 plant lined steps leads down to the sea and the villas private boat dock. Once you're down there, you'll be surprised of what you see - a thermal pool with a circular vaulted ceiling, is partly a natural cave (grotto) excavated by the Romans and used a thermal pool. It is the original, functional remains of what was once were the thermal baths of the Roman villa belonging to Emperor Augustus' grandson. A real wonder of nature and history. The grotto is still fed by the sea with fresh sea water and an ideal, sandy area to swim and relax. The East side of the grotto holds an ancient, Roman fish-breeding pool. A ½ bathroom is comfortably, located along the way down to the sea. 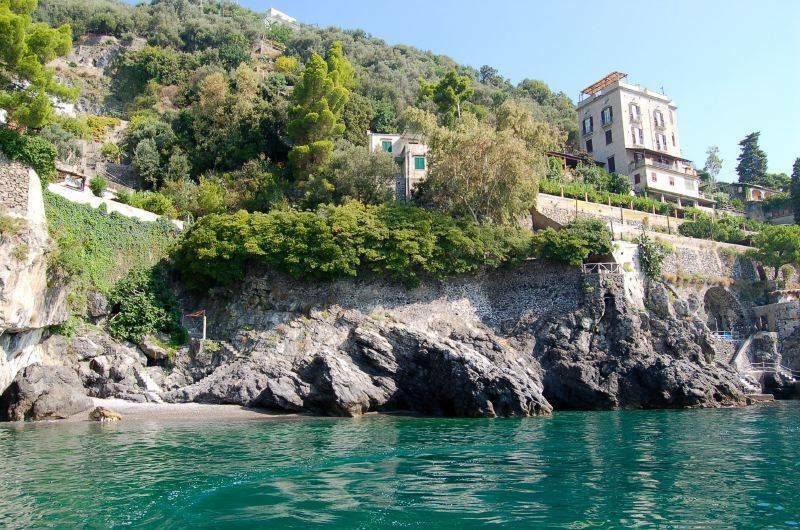 5 steps lead from the grotto to the private boat dock, where a set of stairs leads directly to the sea - ideal for sunbathing and swimming. 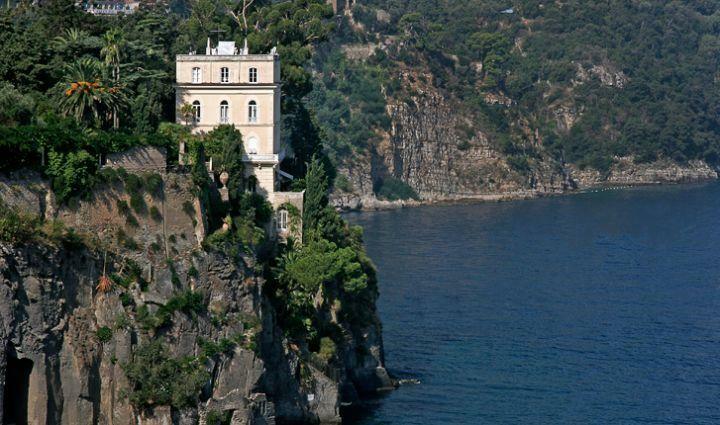 Access The villa can be reached by car or by boat, from the sea. Kitchen: 2 ovens, refrigerator with freezer, ice cream and sorbet maker, toaster, microwave oven, meat slicer. Brick oven. Heating and A/C in all bedrooms/bathrooms. DVD, TV. Pool. (2 - 4 meters wide x 8 meters long). Private boat dock and sea access. Private parking. Staff. Daily breakfast included. Maid service and Cook: A team of experienced staff is available six days a week (and included in the rental price). The staff is comprised of 2 gardeners, Chef (groceries are extra) and one/two housekeeper(s). Daily continental breakfast is included in the rental rate. Bed and linen changes: Towels and beach towels are changed every 3 days and bed linens once a week. Parking: The Villa has a car park on its grounds right in front of the main entrance.